The Rev. James E. McDonald Center for Student Well-Being, better known as “McWell”, underwent a renovation over the summer that transformed the traditional clinical office space in Saint Liam Hall into a sustainable wellness oasis for use by all university students, which parallels the scope of their department. Designed to feel like a “home away from home,” the center’s mission is to educate students about the eight dimensions of well-being through a variety of tools and resources. These dimensions- social, spiritual, emotional, environmental, financial, intellectual, occupational, and physical- can be seen throughout the Center. From spaces designed for community building and creative activities to quiet spaces for meditation and reflection, the center succeeds in providing a diverse and inclusional atmosphere. Rooms in the Center include comfortable group study areas, a quiet meditation zone as well as a break room with art supplies for those who want to get creative without the pressure of being a fine arts student, a Wii and board games for friendly competition. Further, an essential oils station to support the mind and body is located in the main hall. Throughout the renovation special care was paid to being as sustainable as possible. 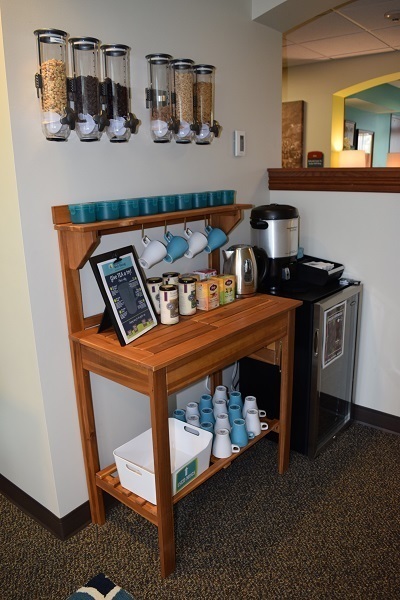 In the Resource Hub, individual packaged snacks were replaced with a sustainable snack model where students are invited to fill reusable containers from bulk food dispensers. 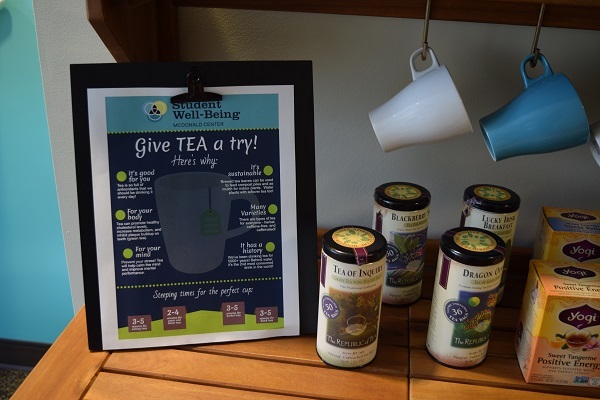 Plastic cups were replaced with ceramic mugs, a Keurig individual coffee brewer was replaced with a multi-cup coffee pot, and care has been taken to provide local, organic, and fair trade berries, snacks, and teas. Sustainable enhancements were carried throughout the rest of the space as well. A gooseneck spigot was added to the water fountain to allow students to easily fill reusable water bottles, all vials at the essential oil station are made of reusable glass, and all lighting is done through LED lightbulbs. 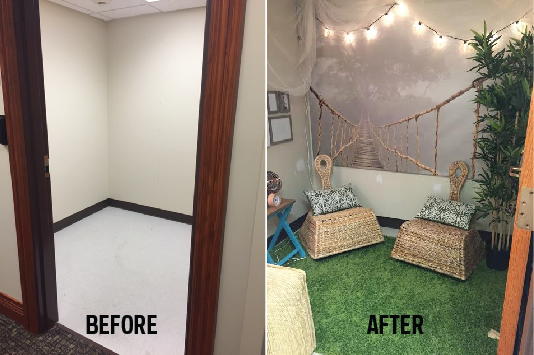 Responding to suggestions from student focus groups, “The Fort” was transformed from its original concept of a simple reading nook to a nature-themed space for meditation and quiet reflection. Soft lighting, low chairs, landscape wall murals, and a sound machine complement a wall of landscape inspired photos- all of which were taken by McWell staff members with the hope that student photos will soon join. The feedback from students has allowed the Center to demonstrate and respond to the necessary and integral role space plays in overall well-being. “In all, we really tried to create an empirically-driven restorative space for students to be able to be stress-free, be authentic, and unwind” said Conrad. Originally published by Dana Bakirtjy at green.nd.edu on September 08, 2016.